This week’s photography website is a local. South African photographer, Rikki Hibbert – who recently did a guest post on Recycling or Reusing Glass Jars as photo frames – is full of fantastic tips and ideas for photographers as well as some great images. Based in Johannesburg, Rikki has images ranging across several genres including Food, Portraits and Travel, a topic that seems to be close to her heart. 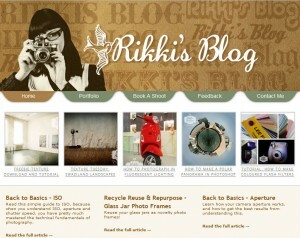 Rikki’s site is a great read and visual feast, so check it out.